Rated 5 out of 5 by deddu from Bright and Creative Good Match 3 with colorful characters. There are puzzles and HO intermixed with matching boards. You are earning money to rebuild the town. Is easy at first, but becomes more challenging as your progress. Rated 5 out of 5 by Kate349 from LOVE THIS GAME! It's been too long since I've enjoyed a Match 3 as much as I've enjoyed this. When you first start playing you think it's the "usual" Match 3, but as you progress you understand that there more involved. Loved loved this game. Rated 5 out of 5 by whatnext from Wish this had a screen saver I loved building this town. Details are great. The only problem is I wish it was longer. I love the many buildings and I'm a train lover so I loved the trolly cars and the train. I got bored with the mahjong but the rest of the game was fun to play. I think more HO's would be better. I enjoy looking at the finished town. Rated 5 out of 5 by scfishieinkt from LOVE GHOSTS Based on the trial this is the best M3 game ever, I love the ghosts and building a town for them. The M3 boards are progressively difficult and interesting with good power-ups. The puzzles are simple, HO scenes easy usually finding 12 of the same object. I think the ghosts are my favorite, they are cute and very polite, and they make different noises when you click on them. This game will be a definite buy for me and one I will play many times. Rated 5 out of 5 by yolesso from something different I bought this game after the hour demo. It was so refreshing to find something different, especially in a match 3. I rarely look at Big Fish anymore because I am so burned out on creepy hidden object games. This game was worth my time and money. 115 levels! Many of them took me multiple tries to complete. Fun graphics, but doesn't take up mega space to download (another reason I've stepped back from BFG). The gameplay is unique in that you must plan your matches to affect the surrounding pieces. The powerups are useful and practical, though few; they are attainable through multi-matches. The mini-games are fun, but it would have been nice to have less mahjong, and maybe some Sudoku. The hidden objects were challenging and cleverly disguised. I had to use the hint a couple of times. I didn't find the music or sounds annoying, but I keep those turned pretty low as a rule. I found this game extremely playable. After completing the entire game, it randomly selects levels for you to play again if you want to continue gameplay. This ones a keeper for me. Rated 5 out of 5 by Iamrhea from A different kind of Match 3 game Like others have said, this is not your typical M3 game. It was such a refreshing change from the almost daily HO games Big Fish offers. Some of the trophies seem almost unreachable (like the one for 200 combos) but if you switch modes to relaxed, it's easily done. There are more levels to play after you have bought all of the items for town as well. Good Going Big Fish! Rated 5 out of 5 by VelvetRose55 from Lots of fun This game is really cute. As the levels go up you are challenged more and more as you are in all good find 3 games. the HOG's had me getting my nose right into the screen. I would recommend this game if you are young at heart. Rated 5 out of 5 by nelliebj from What fun! This is a great Match 3 game with a few puzzles and some "hidden objects" thrown in for good measure. And you get to build a ghost town. The games are challenging enough to hold your interest, there are things to do and all in all, it's just great fun! A definite buy for me (already done). Played the full hour of the demo and have barely started so I know it will be a good, long game. Rated 5 out of 5 by LBF242 from I really like this game I helped beta test this game and could not wait for it to come out so I could play more of it. It sure holds my interest and it is an enjoyable game to play. Thanks Big Fish. Rated 5 out of 5 by cheryledz from CUTE! LOTS OF FUN!!! RELAXING!! I absolutely love this game. 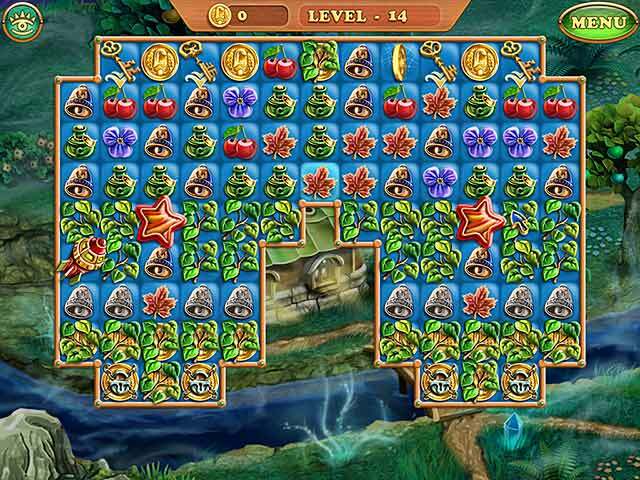 It is a relaxing type of match 3 with some hidden object puzzles. Some people might think that this is just a kids game, but hey; I'm a big kid!! I enjoyed it!! Little ghosts looking like the potato heads! lol Each level gets a littler harder as you go. Played it for my 1 hour and had to get it! I got it with one of my "Free Game Codes", so I didn't have to pay anything for it and I love it! I use those game codes wisely too! I have a sister that belongs to Big Fish & lives in the state of WA. We try to play games together & text each other on what level we are on & who wins first. We haven't found a game lately that we both like, but this will be our next one! The colors are beautiful & you get to build a town. Our kind of game!! Love it! I don't listen to the music much, but it isn't bad on this game either. Not a "cut-throat" type of game. Try it for yourself for 1 hour - you will know whether this is your type of game or not. Rated 5 out of 5 by raydog from Wonderful game! I really enjoyed this game. I stayed completely interested in it, loved the graphics and I am a big fan of match 3 so keeping my interest is a big part of enjoying the game. The characters are just adorable and the story line is cute. It wasn't the hardest match 3 but the unusual levels along with the side games more then made up for it. I get tired of all the hidden object games and my eyesight isn't what it used to be so this was a great change of pace. What's not to love? Rated 5 out of 5 by gmac1007 from A Visual Feast For The Eyes ! I was able to beta test this little gem and immediately fell in love with it and have been very impatiently awaiting it's arrival and finally it's here and it was an instant buy for me and I'm loving this game. Not only is it fun it is simply gorgeous to look at the dev's did an awesome job on the artwork it's a visual feast for the eyes. It combines three elements I love it's a match 3, building, and a few hidden object scenes along with a little mahjong thrown in for good measure. I love everything about this game and I love being able to build a nice safe little haven for the ghost who are simply adorable and who says ghost shouldn't have little neighborhood of their own they don't always like to haunt houses they like to keep house and work in town and go shopping just like us. I love the story and the tiles on the playing field are simply gorgeous and it's an assortment of all kinds of things. Instead of clearing out gold tiles or blue tiles this one has something a little different you have to clear out the coins to beat the level and let me tell you they aren't as easy as they look some are rather tricky to figure out but not to worry there are some killer power up's to help you out and some of these power up's are some of the best I've seen. There are two modes of play timed and relaxed right now I'm playing the timed mode but I'm having so much fun I'm gonna go back and replay it again and this time I think I'm going relaxed because this is one game I really hate to see come to an end and it has so much replay ability and trust me I'm gonna be replaying this one time and time again it's simply one of the best match 3's I've seen in a long time and I'm loving every minute of it and it's done so beautiful the artwork alone will pull you in from the beginning it's absolutely spellbinding and then throw in the cute ghost and you have a match made in heaven ! I really hope we will see a sequel to this one this is one I would absolutely love to see this one keep going it's so fun and very entertaining and I want to give a huge thank you to the dev's on a job well done your hard work paid off and in such a big way so please give us more. Give the demo a try it's so worth it. Thank you dev's for an absolute visual feast for the eyes that's fun too and thank you Big Fish for giving me another reason to shrug my domestic goddess duties. Have fun everybody ! Rated 5 out of 5 by Lyndy20 from Instant charm I liked this game right from the opening screen. The ghosts are cute and there is a cheerful, colourful, cartoony feel about it. There's plenty of variety in the M3s and fun mini-games. There's a large range of buildings, which gives the feel of a long game. All in all, this is a nice one for any age and will definitely be a purchase for me. Rated 5 out of 5 by FloridaGirl7264 from Fun game! This game starts out easy but it does progressively get harder and harder. There is a challenge for seasoned M3 players, like myself. The graphics are beautiful and the ghosts are adorable. A definite buy for me. Rated 5 out of 5 by cartoonman from cartoonman Excellent game play with creative obstacles and a cute story line. It's hard to create new match 3 games but the design team has done just that. I am playing it through the first time in relaxed mode and will play it again in timed mode once I get accustomed to the power ups and strategy needed to win. Rated 5 out of 5 by Tigs535 from Delightful game This is a lovely game if only for wasting some time when you don't want to think. It's also a great game for children. The mini games range from easy to deceptive. The match-3 boards take a little getting used to and I thought it was going to be a very simple game - wrong! The boards definitely get harder as you go through the levels. I loved the graphics and the music. Simply delightful. Rated 5 out of 5 by oxjoxo from happy games for all ages at first I thought this was strictly a younger persons game don't be fooled it can get quite challenging especially the hidden object sections no penalty for using the hint nice clear grapics lots of animation fast paced but also a nice relaxing no timed mode demo kept my interest for an hour a clear buy for me! Rated 5 out of 5 by ecblisa from One of the best match-3's available A complex, fun match-3 game with puzzles and HO scenes added, and it can be played timed or untimed. What more could one ask for? I've played for over 2 hours, and still each level offers something new, either a new power-up or a new obstacle. Instructions are clear, and the powerups are earned by making large matches, and set off by double click/tap or being moved intentionally. The object is to build a town for friendly ghosts. It's all fun, and the town starts earning you coins after a while. I can't tell yet how long this game is, but judging by the available achievement awards, there are ample levels to play. The skippable HO scenes and puzzles are fairly easy, but they give you extra coins if you don't skip them, and I find them relaxing. This is a game I will definitely play more than once. Rated 5 out of 5 by Jazmeania from Surprisingly Fun I don't normally play this type of game, but I was bored and decided to try it. 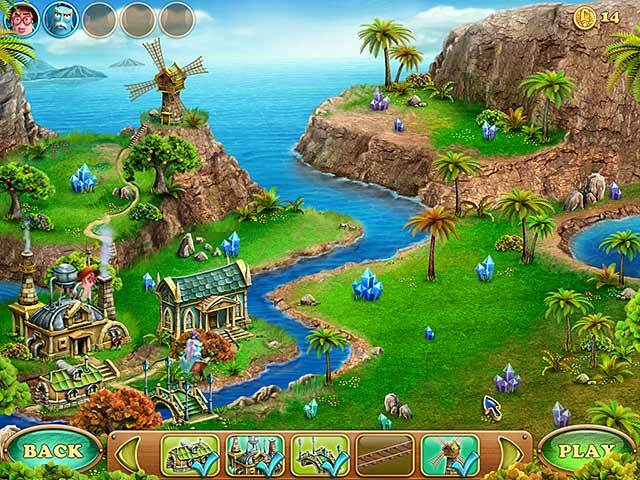 The mini games are fun with some difficulty, because the items blend well with the scenery. The match three get more and more difficult, that was the surprising part. Which helped me decide to make the purchase. Thanks devs a very well thought out game. Rated 5 out of 5 by sb54 from Laruaville I was intrigued my the story.so of course I had to play it It's a cute game. The music is bright and cheerful. This is not a straight match 3 game, but it combines hidden object as well. Also with the coins you are able to build. Which I love to do. Even though I am an adult the little child in me likes to have fun. This is a fun game. I will add it to my long list of games. Rated 5 out of 5 by afoster605 from Not your typical Match 3 Game, but lots of fun! You collect coins to build the town, but you can't match the coins; instead you have to make matches next to them, which was different and challenging. Once all coins are collected, you move to the next level. I played the timed mode, and the time allowed per game was the shortest I've ever played in any match game, but again this added to the challenge. Objects are well hidden, and there are Achievements. I liked the variety of match objects. The ghosts are cute too! Rated 4 out of 5 by Baabs from I love these games ! 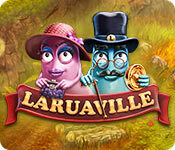 I get a lot of enjoyment out of the Lauraville series. My only wish is that they add more "find the difference" mini games. Some of the series don't have them at all. It adds more for me. Can't wait until the next one ! Rated 4 out of 5 by bessiegirl from could be a challenge on timed mode I never even considered this series of match 3 because it looked so dorky, but being desperate for a match 3 I thought I'd give it a try because of all the high ratings. Glad I did. What a fun match 3 (I still think the characters are dorky though). I played on relaxed mode and found it mildly challenging, however I suspect on timed mode it could be real challenging. I plan to play again on timed mode. Plan to get the whole series. Animations and graphics were fantastic. Music was annoying so I turned it off. I did however get tired of playing the same puzzles over and over, but they gave me gold so I did. You do have the option of skipping them though. Rated 4 out of 5 by LilaJane from Cute & fun Match 3 This is the first Match 3 game I've bought, and I liked it very much. I played with the timer, and I found it challenging. I needed to keep an eye on the timer, and had to replay some levels a few times. Some levels are hard and I had to find help in the game forums once. If you're pressed for time, you can opt to click on the tile and it moves, but if there are options which way it can move, it won't, so I didn't use it much. I found it easier to move the tiles. Some levels are easy. I thought the variation was nice. There are 112 levels, plus I played one relaxed, in order to win a trophy (make 200 combos, not enough time to do it in timed mode!) After which, you can still keep playing but you're given random previous levels to play. In addition to the awards, there are 25 buildings to build for the ghosts. I wasn't done building until just before level 90, so there was a lot to do and to look forward to while playing. The only thing that didn't appeal to me much were the minigames, because there wasn't much variation, but if you keep playing them you are given an award:) You can also opt to reject the minigame challenges. Rated 4 out of 5 by cowclaudia from Very enjoyable Bought this because I was bored with my other games and was tired of "doom and gloom." Thought it was probably for kids but not really - have to do some thinking and planning on your moves and the mini games were fun - hidden objects were VERY hidden and was frustrating at times trying to find them but there's a fast hint button and finally got through it. Had to restart the matching pairs games more than once but enjoyed that challenge. Only thing I didn't like was at the end of the game the town lost some of its charm - too crowded. Rated 4 out of 5 by arnold1049 from BUILD A GHOST TOWN This is a Match 3 game with a few twists. Playing the game and some additional puzzles earns you coins with which you buy buildings and other items to create a town for ghosts to live in, 5 ghosts to be exact. I played the easy, non-timed mode. 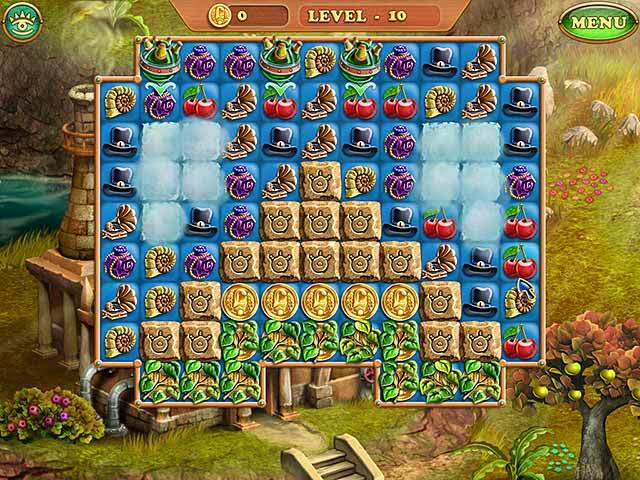 The Match 3 games are varied and challenging, with various power-ups, frozen tiles, tiles hidden behind fog, coins hidden behind vines, and several types of bombs and rockets. There are also achievements to be earned, 3 of which are for finishing a Match 3 game quickly. I was only able to win one of those achievements based on speed. The puzzles consisted of a hidden object type where you need to find 15 of the same object or a mahjong type puzzle. The hidden object puzzles were extremely hard as the items were faded and blended into the background. Often only a very small tip of the item actually showed. I had to use several hints or in a couple of cases I got tired of straining my eyes and just skipped them. The mahjong puzzles were much easier. I haven't played a lot of Match 3 games, so can't really say how this one compares to other similar games but I found it enjoyable.